So we are working on this new top secret project (that’s gonna be really awesome when we release it), and 2 days ago i noticed that some of the icons on the site are blurred. First we spent 5 hours trying to debug this, check CSS, reexport images from Photoshop, try tons of different things, all for nothing. Then i installed back Firefox 3 Beta 4, and checked the same thing, and it works flawlessly. 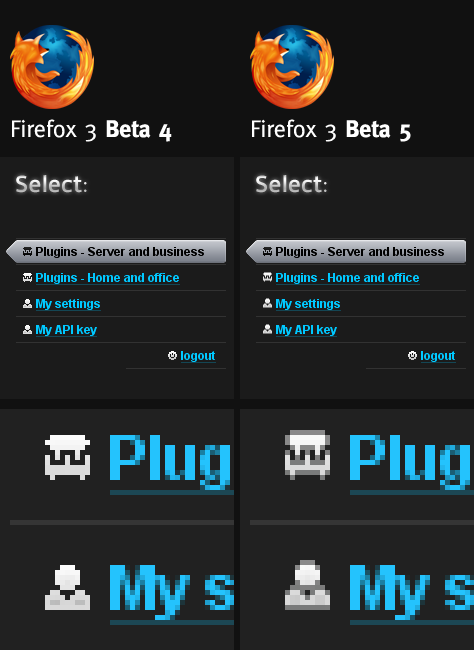 Firefox 3 Beta 5 is for some reasong blurring this images. Are you scaling the images in CSS? We do use a different scaling algorithm as of beta 5, to improve the way images look when full page zoom and other up-sampling cases are in play. Vlad Vukicevic (one of our top graphics hackers) has a post about it at http://blog.vlad1.com/2008/03/18/a-little-more-cairo-just-for-you/ if you’d like more information. Hey Mike. Nice to see you here. No, we are not scaling images, of course, not in HTML, not in CSS, not anywhere. We have just checked more sites on the web that use small icons, and particular icons are blurred. We are trying to find the source of the problem, and all points to Firefox trying to smoothly render images that are placed on weird percentage, or on half the pixel. For example, if we are placing image at 33%, and that falls down to non-integer pixel ( 33% of let’s say 100 pixels), Firefox will try to render that image at non-integer pixel and blur it in the process. This is serious issue that you boys need to look at, because it is impossible to backwards tweak all of the sites. not to mention how much does this bilinear filtering destroys, foe example, Pixel Art Comunity sites such as http://www.pixeljoint.com, pixelation.com, or any other place with integrated zoom scripts. I do ignore if someone is happy with this featurem but i personally find that it literally destroys any planned icon/element on a website.